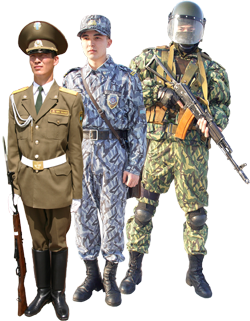 Interior Army of the Ministry of Internal Affairs of the Republic of Kazakhstan was formed by Decree of the President of the Republic of Kazakhstan from January 10, 1992. 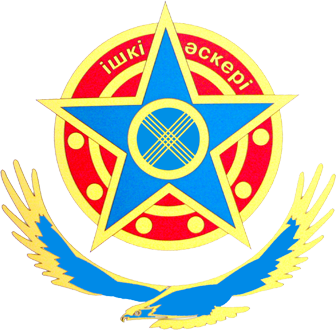 Interior Army of the Ministry of Internal Affairs of the Republic of Kazakhstan is part of a single system of internal affairs of the Republic of Kazakhstan and they are designed to ensure the security of individuals, society and the State, the protection of human and civil rights and freedoms against criminal and other unlawful infringements. Interior Army has a flag and a symbol. Formations and military units of Interior Army have the standard fighting banners. 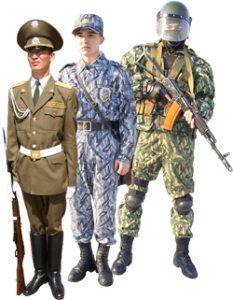 Article 1 of “Law of the Republic of Kazakhstan” “About Interior Army of the MIA of the Republic of Kazakhstan”. The missions of Interior Army of the MIA of the RK. 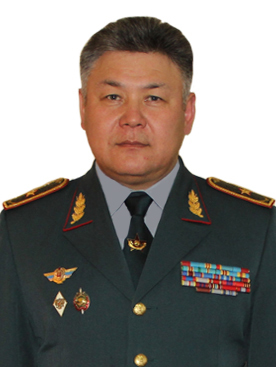 solution of other tasks assigned on Interior Army by legislation of the Republic of Kazakhstan. by military educational institution of Interior Army;- by military units of activity`s equipment of Interior Army. The attraction of Interior Army for performing of missions not assigned on them by legislation is forbidden. Symbols of Interior Army of the MIA of the RK. 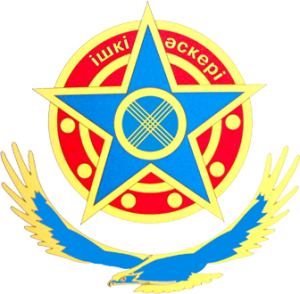 The Symbol of Interior Army of the Ministry of Internal Affairs of the Republic of Kazakhstan represents a correct five-pointed star in emerald-blue colour overlaid on the symbolic image of a round shield and covered with Silhouette image of a soaring Eagle in emerald-blue color from the bottom (the element of State Flag of the Republic of Kazakhstan). 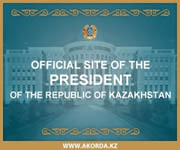 There is image of shanyrak (the element of State Flag of the Republic of Kazakhstan) made in gold and yellow colours in the center. The star and shield edged with contour of gold and yellow colours and the edged ends of Star appears after board outline. There is inscription in Kazakh “Ishki Askeri” in the upper part of shield on circle arches over shoulders of star. Inscription, details of shield and silhouette outlines of Eagle were made in gold and yellow colours. 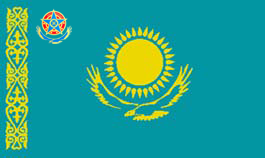 The Flag of Interior Army of the Ministry of Internal Affairs of the Republic of Kazakhstan represents the rectangular bilateral Panel emerald-blue colour, there is an image of the Sun edged with rays and the spreading Eagle over it in the center of it (the element of State Flag of the Republic of Kazakhstan) in gold and yellow colours. There is color schematical image of Symbol of Interior Army – stars on the shield without Eagle in the upper left corner of flag from the face and in the upper right corner from the back. The relation of common width and length of flag is 1:2.